A significant number of Northland dairy farms were offered for spring sale. Although completed transactions were at comparable values to last year, with plenty of alternatives, purchasers are taking time before committing to buy. As Northland dairy properties tend to be lower priced and easier to farm under clean water considerations, the region remains a drawcard for those seeking a smaller property for first farm ownership. Buyer interest from elsewhere in the North Island has been apparent in recent months. One notable sale was a 258 hectare Dargaville dairy farm, producing up to 190,000 kilograms of milksolids, which sold in November for $3.48 million to Bay of Plenty buyers. A 493 hectare Hikurangi property with an 80 bail rotary milking shed and two 400 cow feed pads was listed for sale in late November, and will also attract plenty of attention. With plenty of new listings offered to the rural property market in spring, Waikato buyers had ample choice. Sales, however, particularly of dairy units larger than 100 hectares, were scarce, as purchasers took their time to undertake due diligence. Consequently, the number of Waikato farms transacted in October was well below average for what is historically a busy month. One drystock farm that did sell, a 357 hectare Retaruke property southeast of Taumaranui, which changed hands in November for $2.15 million, demonstrated that the market for property with scope for manuka honey production remains enthusiastic. As the Waikato rural property market adjusts to changes signalled by the new government on clean rivers, foreign ownership, immigration, forestry and other issues, sales activity should begin to ascend again, though this increase is likely to be steady rather than stunning. Like other North Island districts, plenty of dairy farms in the wider Bay of Plenty were offered to the market in spring, though few have yet sold. While many vendors are committed, a proportion of these farms are for sale on financier suggestions that debt needs to be repaid so sales will only transpire above certain prices, which is unlikely. Kiwifruit, particularly orchards already growing the G3 variety, are the backbone of the region’s rural property market. October sales of several of these properties above $1 million per canopy hectare underlined how keenly sought after they are. With prevailing trends in horticulture, a limited number of suitable dairy farms are likely to sell for conversion to kiwifruit during the summer. Such sales will reward vendors generously, likely at least at double the per-hectare value that purchasers would otherwise pay. Although plenty have been offered for sale, as in other districts, Taranaki dairy farms did not sell in great numbers during the spring. Those that did find willing buyers fetched prices between $40,000 and $45,000 per hectare, consistent with prevailing trends. For sheep and beef property in the region, the opposite scenario applies. Product prices are buoyant and the 2018 forecasts for lamb are encouraging. With commodity prices firm or rising, farmers who have thought about selling land are now more inclined to stay in place for another year. While a 31 hectare Taihape finishing property sold in September for $1.125 million, elsewhere demand for Taranaki and Whanganui sheep and beef farms exceeds the number of spring listings brought to the market. Any that are listed for sale in the summer are therefore likely to meet a positive response. Sales volumes in the region were similar to the same period last year. Average values for Wairarapa dairy farm sales are approximately $30,000 per hectare at present, while a 294 hectare Horowhenua dairy property sold for $14.5 million or just short of $50,000 per hectare. A 603 hectare Wairarapa finishing farm sold for $9.3 million. Large-scale sheep and beef grazing and finishing, dairy and arable farms are in hot demand in the region. Allandale, a widely admired 393 hectare Greytown grazing property, currently used for dairy support, will list for sale during spring and should attract considerable attention. Good-quality properties situated in sought after locations, with reliable rainfall, superior improvements and proven performance remain in demand. A range of good-quality sheep and beef farms coming onto the market in spring should satisfy this, in part at least. 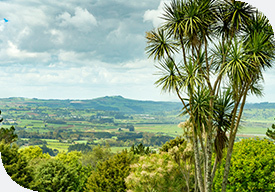 In common with various other regions, Hawke’s Bay’s spring rural property market was hindered by wet conditions, which even affected access to some farms. Uncertainty around the election was another factor holding the market back. Some good sheep and beef properties transacted in the region in spring, with an 800 hectares Rissington farm selling for $8.65 million by tender in early November and Maraekakaho’s renowned 848 hectare Olrig Station, offered to market for the first time since 1859, selling at auction in November for $10.17 million or around $12,000 per hectare. Other sales of notable local properties are likely in the summer. Those motivated to buy Hawke’s Bay farms are looking at performance rather than capital gain. Enquiry is tending to focus on sheep and beef farms between 6,000 and 10,000 stock units, while proven, well-maintained finishing properties are also attracting attention.